It’s unfortunate that Robert Englund has long settled into a phase in his career where the projects he chooses inspire skepticism. As the preeminent horror icon of his generation, his appearances should be met with excitement rather than dread, yet here we are, left hoping that a legend can reclaim greatness. Fear Clinic isn’t exactly that kind of opportunity, but at least it offers a glimmer of hope that he isn’t doomed to completely slum it in films that are only interesting due to his presence. Don't call it a comeback--call it a step up. Based off of a 2009 Fearnet web series of the same name, the film features Englund as Dr. Andover, a scientist who has literally conquered fear. With the invention of an experimental chamber, he’s able to submerge traumatized patients in their own psyche and have them confront their darkest fears. His methods proved to be especially effective for the survivors of a restaurant shooting, at least initially. When this set of patients begins to relapse months later, they reconvene at Dr. Andover’s clinic, where both a stranger (Thomas Dekker) and an unseen, demonic force await to exploit their repressed trauma. Fear Clinic doesn’t lack for ideas: its two plot threads are intriguing enough, with one exploring the psychological effects of trauma and the other giving rise to a supernatural embodiment of repressed fear. In fact, either of these is probably meaty enough to carry an entire movie. When mashed together, they make for a schizophrenic whole and leave you wondering if each wasn’t meant to be different arcs had the web series continued. Obviously, it did not, and we’re left with one film that clumsily bounces back and forth between the plotlines before messily resolving both with an overblown, CG-laden climax. The two subplots are incompatible to boot: one gives up the ghost early on, while the other hinges on a twist that’s simultaneously predictable and ridiculous. You’re left waiting for one thing to happen, while you totally expect the other shoe to drop, at which point your eyes roll all the way out of your head and into the cushions of your couch. But despite its limp story, Fear Clinic is still a decent vehicle for Englund. In this case, he’s actually a co-lead, though the bifurcated structure keeps him all but quarantined to his own half of the story. Dr. Andover isn’t exactly a typical role for the iconic actor: while his face will always produce sinister vibes, Englund’s melancholy eyes hint at the character’s regret. Far from Freddy Krueger, he’s a tortured genius in the Dr. Frankenstein mold, a driven but acidic man haunted by both his successes and failures. We catch him at his lowest moment, all strung-out and despondent about a former patient’s death, which allows him to brood and glower his way through Fear Clinic. At least it’s something, though—if nothing else, the filmmakers here respect Englund enough to let him show off his acting chops, something a lot of other films don’t even bother to do. He’s opposite a solid enough cast, too. Fiona Dourif is one of the former patients and continues to emerge as one of the genre’s most promising talents. Her pluckiness and vulnerability is classic Final Girl material, and she carries the half of the film dedicated to the survivors. Most of her subplot is shared by Dekker, whose performance confines him to a wheelchair and demands he be mute until he enters the fear chamber, the inciting incident that sends the plot on a downward spiral. The overstuffed script also carves out a little bit of time for the other survivors (Cleopatra Coleman & Angelina Armani) and a couple of orderlies, one of whom is played by Corey Taylor of Slipknot fame. You won’t be surprised to see that he’s rocking a wallet chain like it’s 2001. More surprising is that Fear Clinic wasn’t actually made in 2001. The latter is a pleasant surprise. Between Taylor’s presence and some of the stills on the back of the Blu-ray cover, I was prepared for one of those re-heated, early-millennial nu-metal thrashings, complete with ashen photography and frenzied editing. Instead, Fear Clinic is appreciably slick and atmospheric, as Andover’s clinic takes on otherworldly hues and becomes progressively claustrophobic as fear manifests itself. 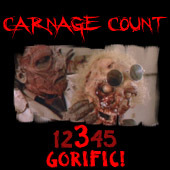 Director Robert Green Hall counters the ambiance with some visceral moments as well: characters vomit gross bile and have grotesque growths excised from their bodies. The restaurant shooting is a recurring sequence shot with terrifying efficiency, highlighted by close-ups of various victims to emphasize the horror. Eventually, Hall loses control a bit and indulges in an overcooked, hyperkinetic third act that leans on too much CGI; it’s here that the intimate stakes of the survivors yield to a massive force of supernatural nature for a jarring and disappointing anticlimax. Oh well—at least Englund looks like the Borg or something at one point. It’s neat enough. I’d really like to say Fear Clinic represents a comeback for Englund, but I’ll stop just short of that. That it feels like a step in the right direction speaks more to the quality of some of the other films he’s recently starred in more than it does Fear Clinic itself. Nevertheless, at least it can boast that much, and the filmmakers are so confident that they leave the door propped wide open for a sequel that seems promising enough—it would be nice to see a film that dives inside of Andover’s head to reveal what terrifies him in light of Englund’s most famous role. For now, check out Anchor Bay’s Blu-ray release of Fear Clinic, which arrives with a solid presentation and an 11-minute making-of extra that discusses the project’s history, particularly its transition from web series to feature film. There’s promise here, and I wouldn’t be opposed to a return visit to Fear Clinic. It’s nice to think Englund may have found himself a new franchise to have fun with—and it’s even nicer to be optimistic about it. Rent it!